Should a landlord be allowed a percent of sales in lieu of charging rent to a marijuana business? Addressing the issue was among the 12 agenda actions sent out for public comment after the Alaska Marijuana Control Board met in Fairbanks July 12-14. By a 3-2 vote, the board settled on a proposal to prohibit future license applicants from lease arrangements that include a percentage of revenue in exchange for rent. Alcohol and Marijuana Control Office Executive Director Erika McConnell estimates at least 25 percent of the nearly 200 marijuana businesses across the state have this sort of lease arrangement. “We see the arrangement on the license applications as they come across,” said Chairman Peter Mlynarik said. Some landlords take 5 percent to 20 percent of revenue in the grow operation, dispensary or other cannabis businesses in exchange for decreased rent. The other option would have allowed a financial interest limit of 5 percent or less, and the landlord would then be required to undergo the same licensing review as the business owner. After lengthy debate, the board agreed to adopt the first version prohibiting any percentage of sales agreements and sent the measure out for 30-day public comment. They will take up the measure again Sept. 14-15 at the next board meeting in Nome. At that point, the board could amend it or adopt it as is. Brandon Emmett and Nick Miller, who are the industry representatives on the board, argued that such arrangements can lend financial support as the owner gets his or her business off the ground. Regulations spell out that only Alaska residents can own an interest or work in a cannabis business. But the board’s attorney Harriet Milks of the state Department of Law said there is no intent to deprive new businesses of adequate investment. The idea is to keep out unwanted influences that could put a criminal element into legal operations. She also brought up the Cole Memo, a 2013 document by former U.S. Deputy Attorney General James Cole that outlines guidance for states’ legal, adult use cannabis industries. Under the Cole Memo, which is under review by the new leaders of the Department of Justice but is still the operating policy, as long as states maintain strict regulation that doesn’t leave open loopholes for criminal activity, the federal government would not look to enforce federal marijuana laws in those states. “We don’t want to attract unwanted federal attention,” Milks said. Those that already have a percentage-of-revenue in exchange for rent would be handled during the license renewal process, Milks said. 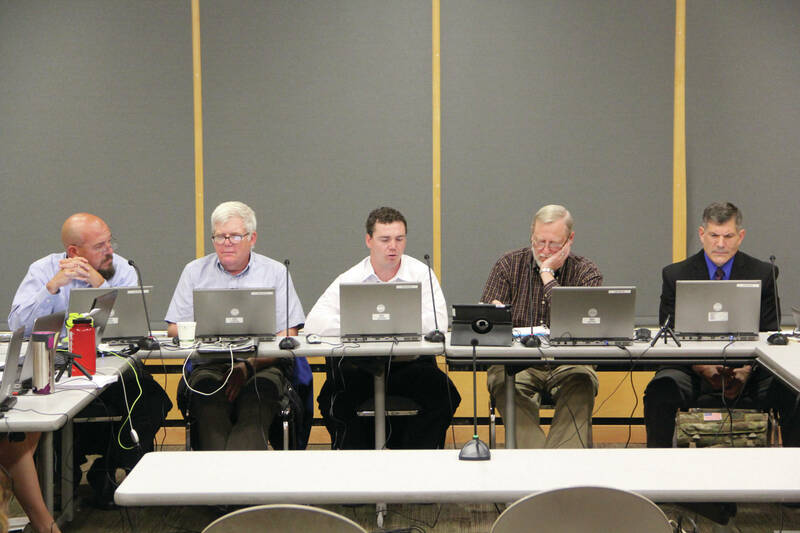 While on-site consumption proved the most hotly debated agenda item for the five-member board and that too will go out for public comment, a dispensary’s ability to promote its facility came in a close second. Currently, many of the violations cited by enforcement are due to advertising, said Enforcement Supervisor James Hoelscher in his report to the board. One of the intents of all advertising regulation is to avoid advocating or encouraging youth consumption of marijuana products, board member Loren Jones said. But not being able to sponsor public events as a marijuana business “demonizes the industry so that they can’t participate in community-building events,” Emmett said. The new regulations going out for public comment would specify that all promotions must take place inside the licensed business, not in a park or at a public event. New regulations also would separate business advertisement rules from product advertisement rules. Questions about local government jurisdiction also will be going out for public comment. Currently, cities must be notified each time a license is granted to an operation in that jurisdiction. But the land-use authority may be a borough government and in rural Alaska, the local government in authority might be a Tribal entity. A new regulation would require notification to go to all relevant local entities that have separate duties over authorizing land-use and taxes. Milks said Tribal notification is more complicated. This measure would have amended regulations to say that an individual would be prohibited from obtaining a handler’s permit if they had committed a felony in the previous five years. This was amended to read two years after board members said smaller communities offer fewer employment opportunities and the businesses need to be able to hire as many employees as they need. The permit is necessary for all employees of a cannabis establishment, including cashier sales and janitors. Other matters taken up by the board related to industry quality control, plant count for new cultivators, removing the time limit on public objections, notification of crime on the premises within 24 hours, kief and testing trim and requirements for testing equipment failure.